Offering you a complete choice of products which include safety light curtians type 2, type 4, reer safety light curtains, safety speed monitoring interface, safegate, micron light curtains and electrical safety interlock. Our firm is renowned entity, engaged in offering high quality Safety Light Curtains. Under the precious guidance of professionals, we design the given range of safety light curtain by utilizing updated technology. We perform a series of test on this safety light curtains in order to make certain its quality. 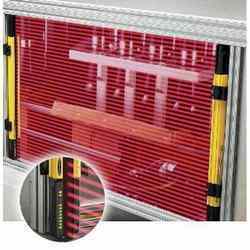 Our customers can take the entire range of safety curtains from us in various stipulations at affordable price. Both modules integrate: Manual or Automatic restart selectable. Faults signalled by LED “Fault” and a PNP system status output. PNP status output indicating overspeed or underspeed thresholds crossing. Both modules have 2 inputs for PNP proximities switches. The new SAFEGATE type 4 range of safety light curtains is the ideal solution for the protection of a vast numbers of high-risk industrial applications, in particular those requiring a high level of integration of the muting functions. Including special mounting brackets, floor mounting columns AND connection boxes. Light curtains for industrial and civil applications where it is necessary to detect, measure, and recognise objects. 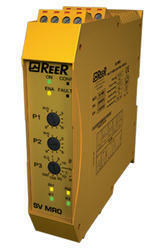 It acts by monitoring and interrupting the safety circuit during dangerous scenarios. Looking for Safety Light Curtains ?